Drain lining and re-lining is the original no-dig solution to a wide range of minor problems such as splits and cracks in drain pipework and joints, providing a fast and mess free solution across London, Surrey, Sussex and Kent. A clever combination of inflatable tubes, sticky resin and tiny cameras means that drain excavations can be avoided in many cases; it’s quicker, cheaper and just as effective installing a drain lining to any damaged pipe. Whether the pipe has been damaged by a tree root, ground movement or a simple crack or split, the problem can often be solved with a lining of toughened epoxy that sets hard and lasts for many years. Working across Kent, the South East and London, we provide a comprehensive range of drain lining and re-lining services. So call us today on 0800 781 8922 to arrange your free property survey and no obligation quotation at your convenience. Getting a good result requires using the right tools and materials, applying plenty of experience and skilful combination of CCTV monitoring positioning everything. A professionally carried out relining leaves things water tight and smooth ensuring good water flow in future and reliable service for many years to come. Typically, the drain can be back in use within a few hours once the resin has fully cured; we can fill the inflatable tube with hot water to speed this process when urgent. Re-lining means a lot less reasons to have to excavate and replace a whole drain pipe; a time consuming, costly and disruptive process, when properly applied the end result of drain lining is identical with none of the hassle. We’ve re-lined drains for customers throughout Gillingham, Chatham, Rochester, Strood, Maidstone, Sidcup, Dartford, Gravesend, Sittingbourne, West Malling, Orpington, Sheerness, Northfleet, Crayford, Sheppey, Whitstable, Margate, Herne Bay, Ramsgate, Faversham, Medway and London. 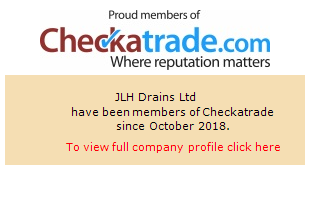 Whatever your drain lining or re-lining at home or at work speak to the experts at JLH Drains for a professional and comprehensive range of drain repairs and maintenance services; contact us today to arrange a no obligation survey and quotation with one of our friendly team. We carry out fast and minimal damage drain excavation services when drain replacement just won't do. This service is provided to homeowners across Kent, Medway, London, Sussex and Surrey. We will get to you quickly! Based throughout Kent, we will reach you within just 90 minutes if you need your blocked drains repaired urgently. We are available 24/7 and can get to anywhere in Kent, Medway, London, Surrey and Sussex, so rely on us to take care of everything for you quickly and efficiently!